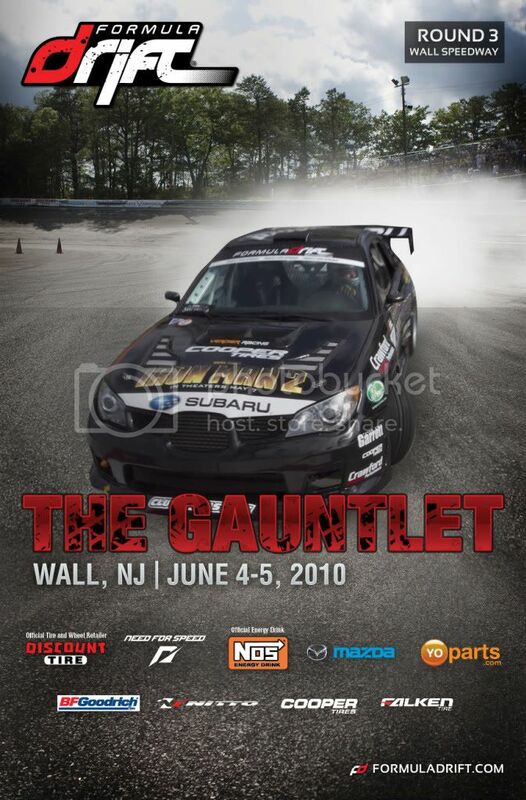 First opening in 1950 as Wall Stadium, Wall Speedway as it’s now known will host Round 3: The Gauntlet on June 4-5, 2010. The track lives up to its moniker as the "Gauntlet" with a 16 degree banked oval along the straightaway and 30 degrees on the turns. The drivers will be challenged on this course and this track is the first on the schedule where drivers utilize the entire oval. This course is very tricky and many drivers have fallen victim to the degree of difficulty that the bank, straightaway, and inside turn creates. Each seat in the house has a great view of the action within the “bowl” and fans will not be disappointed. The final East Coast round at Wall Speedway will be one of the most exciting events of the season. The 2-day event weekend will be filled with the best drifting action in the nation with the top drivers putting it all on the line on the very tricky course. Wall Speedway is a very fan-friendly venue and fans will be treated to a great view of all the action. ^^ Did you just post the same thread on the rx8club.com??? I was just going to post this thread. The event is only 3 weeks away! Its always fun, and TST will be out covering the event as always. We might even have some more going on but I'm working out details now. group drive to this from philly/sj area? "I refuse to be embarassed by a car that looks like a trapper keeper." anyone from ny caravanning down there? I'll be out there. I'm down for a caravan. ...I hope they did something with that dirt parking lot. That was crucial on my car last year with all the dips. I've gone every year since 2006. Then you'll get stuck, and you'll have an awesome spot. Also do some things with it, with fro boy's whip. At this rate, though, it'll be 2015 before either of you gets yo whips running right. Last edited by Evil M; 05-19-2010 at 02:51 PM. Btw, is anyone planning on going both Friday and Saturday? Due to the revised structure of FD, Qualifying is now on Friday instead of Saturday. Saturday Qualifying has been replaced with the Round of 32, but if you're like me, you want to see some specific drivers that may or may not qualify. whats restructured? is it gonna end earlier in the day? cause that would be awesome for me since i have to leave around 5 to go to work! edit: looked at schedule, doesn't seem to be ending any earlier, bahhhh. Basically, they just shuffled around the way qualifying is done and added a top 32. Top 32 is pretty sweet because it adds an extra round to the event, and can lead to some interesting upsets. I think it ends at 5pm on Friday and 7pm on Saturday. Depending if I can get off on Friday and if you're driving Dustin, I'll go! I'll def be there Saturday though. I'll probably take a half day, and I don't have a problem driving. I'll talk to you about it next week? The Englishtown Road Course they did in 08 was so much better, but none the less Ill be there. I'd have to disagree with you there. For an event the size of FD, Wall is a much better venue. It's designed around seating a crowd the size of what FD draws, whereas Englishtown's Road-course isn't really designed to handle a crowd that large. I'm also partial to the track layout used at Wall, I feel like the clipping point on the bank in addition to the crossover in the mid-field add an excitement to runs that can't be replicated on the E-Town Road-course. Don't get me wrong, Englishtown is a fantastic venue for drifting, just not FD style events. I highly agree! Much more entertaining to watch. The only problem was seatting and view points along with the fence in the way to get pictures/videos.